Marathon training & Running Conditions. Osteopathy & Sports Massage? Marathon training and running conditions? 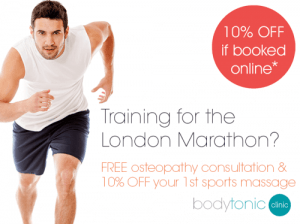 Osteopathy & sports massage can really help you through your journey from running training to after the race day. Osteopathy and sports massage can really help you through your journey from starting training to after the race day. Some people maybe be used to these distances and some people have never run before or at least not 26.2 miles (its a long way to run). Whether you are a seasoned pro or a first timer, you will be putting your body through a lot of stresses and strains. Injuries can happen whilst training and during the race and in some cases you may need to seek advice from a therapist such as an Osteopath. Osteopaths use their hands to diagnose and treat the underlying cause of the problem. They take a holistic view when treating the musculo-skeletal system to encourage the body to work as efficiently as possible, allowing the body to restore itself to normal function. It is important during your training that you have a good strength program and that you give your body time to adapt to the distance otherwise you are at the risk of developing repetitive overload injuries including, plantar fasciitis, ITB syndrome, achilles tendinitis and medial tibial stress syndrome (shin splints). Osteopathic treatment can help to treat running related injuries and to offer advice on strengthening and injury prevention. Osteopaths can assess you bio-mechnically looking at mobility and stability throughout your spine and lower limbs. 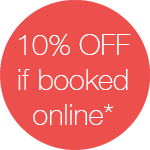 Once your injury is under control an osteopath may advise to continue with a series of sports massages. Most people find that on the lighter days of training the benefits of Sports massage and can be really noticeable. Treating muscular tightness and allowing a couple of days for your body to heal can help with your training. Taking a day post treatment is advised to maximise the benefits of the massage and give your body time to recover. Its recommended whilst training for a marathon that you receive a weekly Sports massage. A constant build up of tension in the muscles from regular activity may lead to stresses on joints, ligaments and tendons. This overuse can often create problems and imbalances in the soft tissues and if ignored, can lead to chronic long term injuries which may affect improvement and performance. Sports massage techniques are suitable for both sports people and non-athletes alike and can help with injuries, chronic pain, muscle aches and restricted range of motion in all of us! It can help be an effective therapy for releasing muscle tension and restoring balance to the musculo-skeletal system, optimising flexibility and maintaining a healthier physical state. Kinesiology taping can be combined with sports massage and osteopathy and can be used throughout training for the marathon. 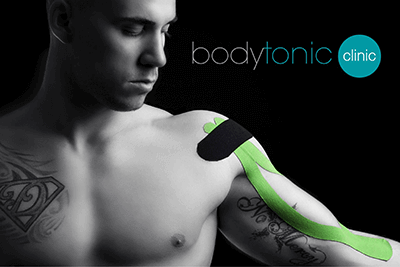 It allows for movement in the affected tissues, but has the ability to aid the lymphatic and muscle systems, substantially reducing recovery times, whilst improving range of motion and muscle activity. Your plantar fascia is a strong band of connective tissue on the sole of your foot connecting from your heel to your mid-foot which supports the arch of your foot and helps to absorb forces when you are running. Plantar fascitiis occurs when this connective tissue becomes inflamed, causing pain in the sole of your foot. Pain is the main symptom of this injury particularly when you are weight bearing and it’s tender to touch. Plantar Fasciitis can be caused by a sudden increase in running intensity or mileage, really tight calfs and hamstrings muscles that cause additional tension into the plantar fascia or a change in running surface causing an increase in compressive forces going through the foot and ankle whilst running. It is important also to consider footwear with not enough cushioning or support. It would be worthwhile seeing an osteopath for an assessment, advice and specific exercises to optimise the recovery process as fascia tissue heals relatively slowly in comparison to muscle as it is a different tissue composition. 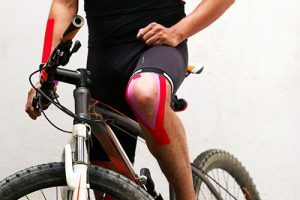 Or ‘runners knee’, this is a very common injury with runners, the repetitive, demanding nature of running causes additional forces through the knee cap and can cause irritation into the tendons around the knee if there is a knee cap maltracking. Symptoms of this injury are dull aching type pain around the knee cap (maybe swelling), especially at the top of the knee cap. The pain will be worse upon loading the knee so walking up and downstairs, running after a short distance (maybe 5 miles) and after runs that evening or the following morning. Seeing an osteopath to establish why you are experience pain in one knee and assess how your whole body is moving (ankles, knees, hips, pelvic levels and spine), identify muscular imbalances, gains hands on treatment and give specific exercises sooner rather than later is advised. Your achilles tendon runs from the back of your heel to your calf muscles. Injury to the area may be caused poor running technique, increasing your mileage and/or speed too quickly, poor function of the ankle, knee or hip functions, tight calf and hamstring tensions. Feeling pain and tenderness to touch along the back of foot or above the heel (sometimes swelling) are normal symptoms aggravated by weight bearing, walking up and downstairs and running. If this occurs rest from training initially to allow time for the tendon to recover, visit an Osteopath who can give hands on therapy and exercises to optimise your recovery. A dull achy pain down your shins that becomes progressively sharper aggravated by weight bearing could be a sign of shin splints. Gentle stretching for your shin muscles (tibalis anterior) and calf muscles, rest and book an osteo appointment to get it checked out. Do not ‘push through it’ in this case, as you may damage the shin bones. Shin splints can be caused by muscular imbalances, tightness and running technique. If you are new to running and the compressive loading through the feet and ankles this could increase your risk of having shin splints. An osteo can give hands on treatment to lightly stretch the muscles and articulate the joints and advise you on a rehabilitation plan to aid your recovery. Shin splints can effect mainly the muscle in the earlier stages but it is best to get on top of the symptoms before affecting the bone. You can recover from all these 4 running injuries given a well structured rehabilitation plan and time. An osteo will assess your posture, joint and muscle movements to identify imbalances and leg lengths. Hands on therapy to stretch the muscles, articulate joints, manipulate joints (only if appropriate and with consent) and exercise prescription to get you back to training as quickly as possible.